Taxes now or taxes later? Unfortunately, “No taxes at all” isn’t an option. But when it comes to your retirement savings, you do have some control over when you pay Uncle Sam. According to a recent study by the National Bureau for Economic Research, about half of all employers now offer the option of either a traditional 401(k) retirement plan, where your employee contributions are made pre-tax (though you’ll pay taxes on the money eventually), or a Roth 401(k), where the contributions are included in your taxable income now so you won’t pay taxes later when you’re actually using the money. In spite of the availability of both types of 401(k) plans, fewer than 9% of workers with a 401(k) are opting for the Roth, even though they might not understand the respective merits and risks of each option. Here’s some information you can use decide for yourself which type of plan is best for you. 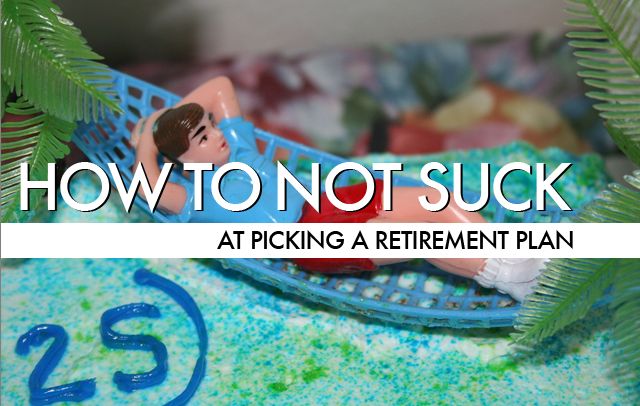 Let’s run down the differences between these two retirement savings plans. A traditional 401(k) allows you to make pre-tax contributions to the account, which gives you some tax savings today. So if you earn $50,000 a year and contribute $5,000 annually to your 401(k), you’re only taxed on $45,000 of income. Of course, you’ll have to pay taxes eventually. When you withdraw the funds in retirement after age 59-1/2, the withdrawals are considered ordinary income and the tax bill comes due. Withdrawals before age 59-1/2 are subject to a 10% penalty, and you’d still have to pay the taxes. With a Roth 401(k), your contributions are made after-tax, so there would be no change to your taxable income for the year. But when you withdraw the funds, they come out tax-free. You can take your contributions out anytime without facing taxes or penalties, but the earnings in your account would have to stay until you’re 59-1/2 — unless you’re willing to pay that 10% penalty. Both account types have the same contribution limits: $17,500 in 2013 for workers under age 50, and $23,000 for those 50 and older. Your total contributions — whichever plan you choose — can’t exceed those limits on an annual basis. Your employer may offer free money via “matching funds” — usually based on a percentage of what you contribute. Matching funds must go into a traditional 401(k), no matter where your personal contributions are invested. Starting at age 70-1/2 (or the year in which you retire, whichever is later), most people must take required minimum distributions (RMDs) from either a traditional or Roth 401(k), whether or not you need the money. The attractiveness of tax-free funds in retirement may make Roths seem like a slam dunk, but a lot will depend on the particulars of your finances. If you’re in a high tax bracket today, you may not want to give up the chance to reduce your taxable income through contributions to a traditional 401(k). Plus, if you expect to be in a lower tax bracket in retirement, making the tax payments sometime in the future may be a better bet. If you’re young, a Roth may be more enticing. If you’re just starting in your career and not earning a high salary, you’re probably not paying all that much in taxes. That means you probably wouldn’t reap much benefit from lower taxable income today thanks to pre-tax contributions to a traditional 401(k). The Roth is also attractive if you think tax rates, in general, will rise in the future. We don’t know the future of taxes, but it doesn’t take a crystal ball to see rates won’t plummet any time soon. Here’s another consideration: If you’ve already built up a sizable nest egg, and you think you’re not going to spend it all in retirement, you may want to use a Roth as a savings strategy to build up a tax-free inheritance for your heirs. We tested a few scenarios to see the difference a Roth might make to the future retirement incomes of John Q. Investor. John wants to estimate the difference in his retirement income if he saves in a Roth 401(k) or a traditional 401(k). He earns $50,000 a year, which puts him in the 25% tax bracket. He contributes $5,000 per year to his 401(k). The account earns an average of 8% a year while he’s working, and he expects it will earn 6% a year after he retires. If John starts saving at age 25, a Roth would give him $23,770 more in annual retirement income than he’d have if he saved in a traditional 401(k). If he starts saving at 45, John will still make out slightly better with a Roth, able to enjoy an extra $4,190 a year in retirement income. Remember, the Roth isn’t the winner for every situation, so try out some comparison calculators to see exactly how you’d do with each type of plan. This one from Charles Schwab allows you to account for several factors, while this one from BankRate shows what can happen if those with traditional 401(k) plans can earn if they invest the initial tax savings. AM I STUCK WITH WHAT I HAVE? While most people can’t roll Roth 401(k) earnings into a traditional 401(k), recent changes allow you to roll your traditional plan into a Roth. Of course, that means you’ll be hit with taxes starting that year. You won’t pay any penalties, but you should check to see if doing away with the pre-tax contributions will bump you into a higher tax bracket. Of course, you can only roll your traditional 401(k) into a Roth if your employer offers the Roth. These plans have only been around since 2006, so they are still gaining in popularity among employers. Depending on your employer, you may not have to choose one or the other. Some employers allow you to split your contributions between the Roth and traditional options. Just remember that between the two plans, you still can’t exceed the total contribution limit for the year. When my husband’s employer first offered a Roth 401(k), we jumped in with both feet, or more accurately, with all his contributions. But when our tax bill came due the following year, we realized we missed the tax savings of the pre-tax contributions — big time. So we decided instead to split the contributions — half in the Roth, half in the traditional — which would give us the best of both worlds. Plus, it will give us choices when it comes to withdrawing funds in retirement — tax diversification — something we’ll probably appreciate when we’re in our golden years. Are Employee Student Loan Contributions The Next 401(K)?